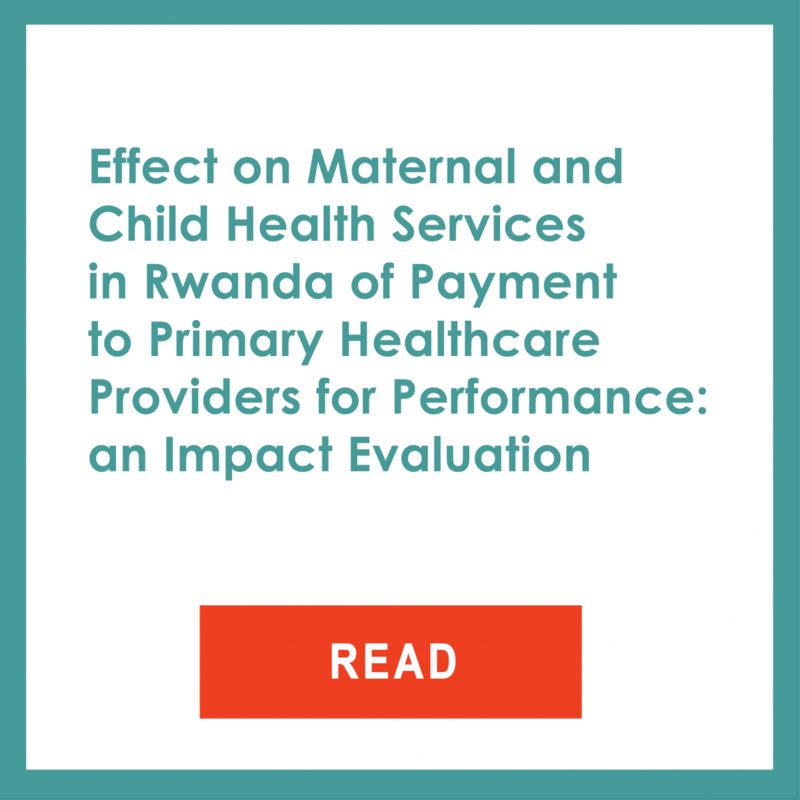 Despite the significant positive effects (e.g., increased utilization of institutional delivery and child preventive care services) of the national supply-side Performance-Based Financing (PBF) program implemented at the health facility level in 2006, the evaluation also pointed out the limited effect of the supply-side intervention on services such as the demand for timely prenatal care and family planning. Combination of demand-side and CHW rewards. These CPBF interventions were introduced in randomly selected sectors. The program also included an impact evaluation that measured qualitatively and quantitatively the effect of these interventions. A prospective, randomized design was used to evaluate the causal effect of the CPBF interventions on the utilization of targeted services. The evaluation design had four study arms. The first three arms of the study are the aforementioned three components of the program and the last arm consisted of CHW cooperatives that received equivalent increase in funding with no conditions. Therefore, this latter group serves as a comparison group to measure the effect of the different interventions. Only the quantitative outcomes of the evaluation are discussed here since the qualitative report has not been finalized yet. 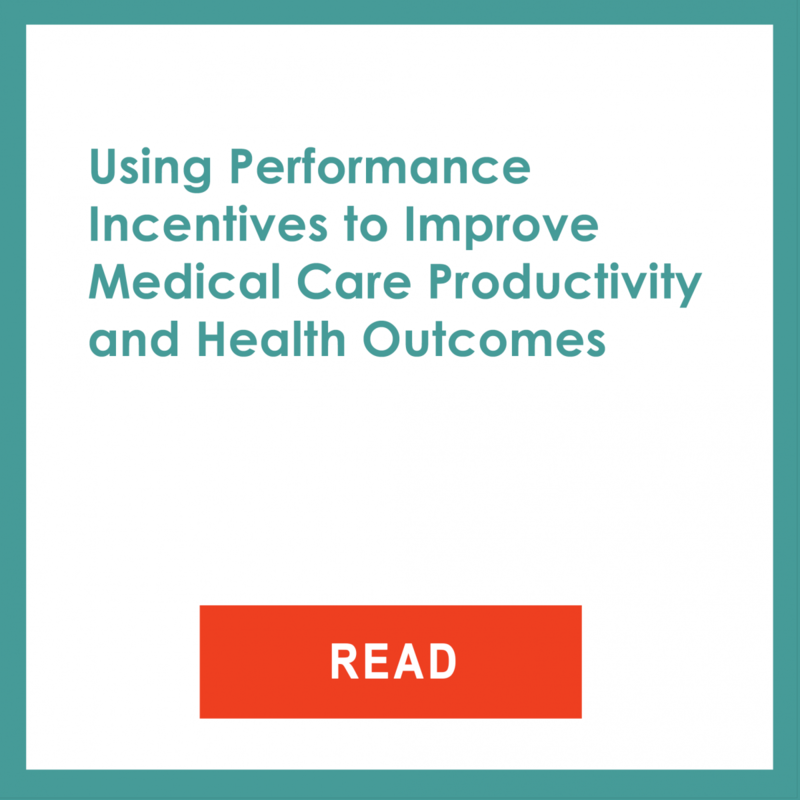 The available results indicated that the conditional in-kind incentives had a positive impact on timely antenatal (ANC) and postnatal (PNC) care service provision. However, there was no significant effect on skilled-attended in-facility deliveries. These positive impacts are remarkable since the survey data also showed that the in-kind gifts were not always available at health centers. In the study arm, only implementing in-kind incentives, women were 9.6 percentage points more likely to attend ANC during the first four months of their last pregnancy and 7.2 percentage points more likely to attend PNC within the ten days after delivery. 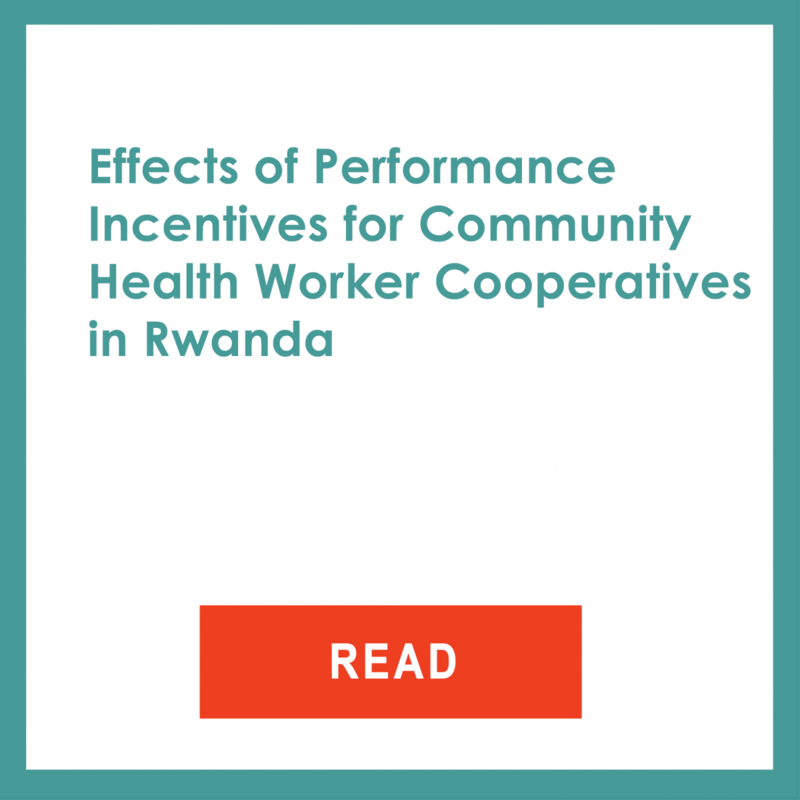 Supply-side incentives to CHW cooperatives did not impact any of the outcome indicators. The supply-side intervention group when compared to the comparison group showed no significant differences in the rate of women who report timely ANC and PNC or skilled-attended in-facility delivery. 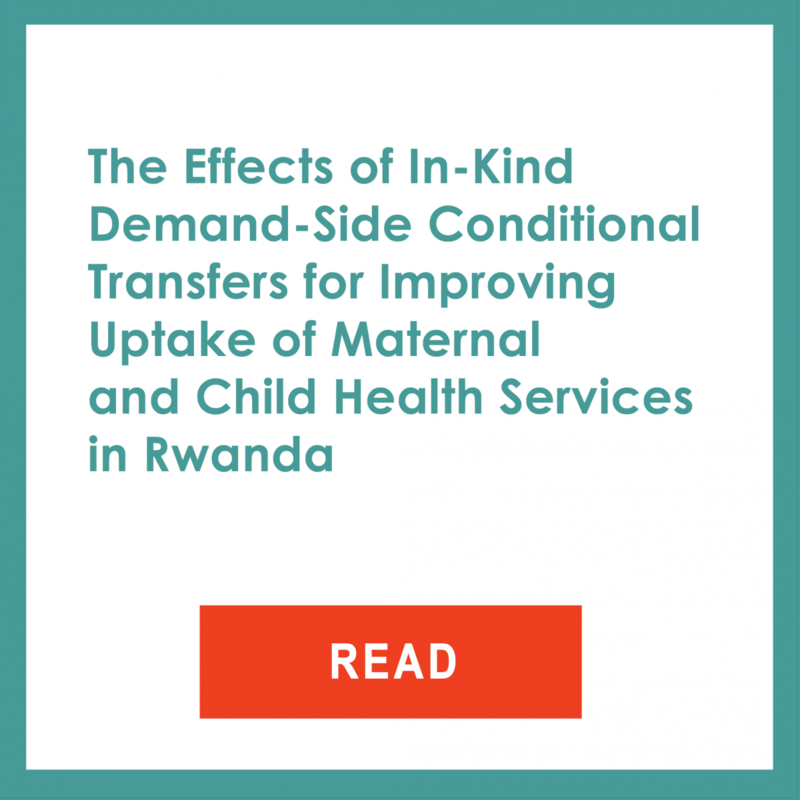 The quantitative findings also indicate that there was no multiplicative effect on outcomes when demand and supply-side interventions were combined. Overall, outcomes measured at the combined treatment group were very similar to those measured at the demand-side treatment group. Sectors are the third level administrative subdivision in Rwanda (after provinces and districts).